For the most part, I have had a lot of luck with bread recipes. If it does not work out the way I want on the first try I begin the tweaking process. It is not always fast but I get there in the end. I say for the most part because I have had one bread nemesis. One bread that, no matter how I tried, would never work out the way I wanted. That bread was the delicious Indian flat bread called naan. Naan is my nemesis no longer. 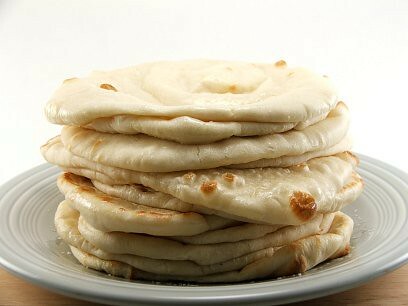 Now I have a recipe for naan that is tender, chewy, crispy, and soft all at once, and is terrific stuffed with curry. The recipe is adapted from one found here. Along with a good recipe I have a good cooking method. 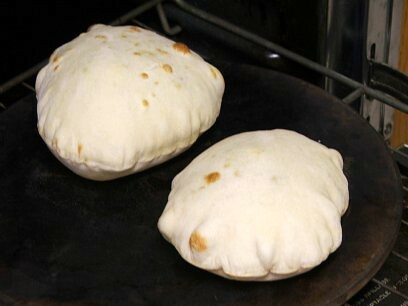 Naan is made, traditionally, in a tandoor oven which produces an insane amount of heat. 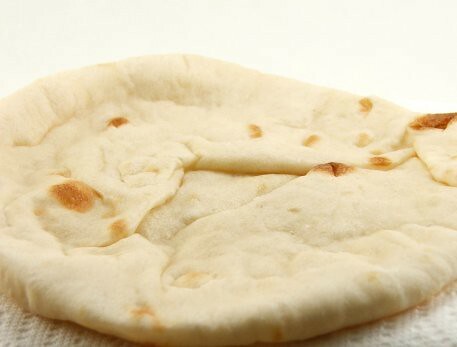 If you want naan that has the right texture, the soft inside with the chewy exterior, you have to find a way to replicate a tandoor at home. I tried the grill with average results. 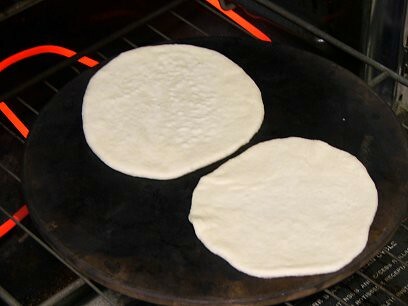 I tried the stove, in a similar way that I cooked my tortillas, but it was not hot enough. I make pizza at home from time to time and have two very well seasoned pizza stones. On the internet I had read that some bakers use their pizza stones, in a smoking hot oven, to achieve a tender interior with a crisp exterior. It sounded promising, so I tried it. I heated the oven to 500 F with my pizza stone on the lowest rack of the oven. I let it heat for thirty minutes and then added one rolled out piece of naan. It was as close as I will ever get to perfect, and it is pretty darn close! Another thing I discovered is that you need to have patience. Don’t rush the naan. Give the dough a two hour ferment, then after they dough is divided give it the full half hour proof on the bench before rolling. 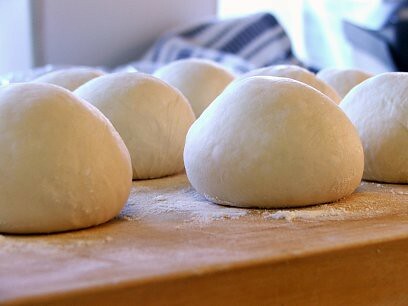 Letting the dough develop will give you the taste and texture you want. Activate the yeast in the warm milk with the sugar added. Combine the flour and salt. 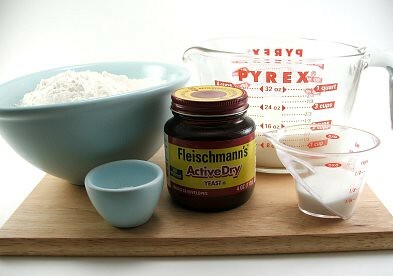 Once the yeast is active, combine the yeast mixture with the flour mixture. Mix in a stand mixer on medium speed for 5 minutes, or knead by hand until the dough is smooth and elastic. Allow to rest for two hours, covered with a towel or plastic. 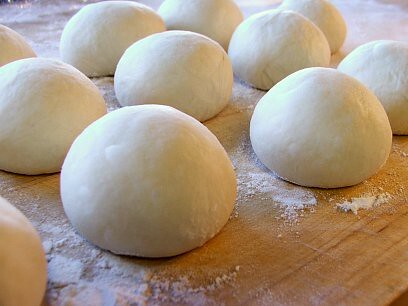 After the dough has rested turn it out onto a floured surface and divide into 12 equal pieces and round them into balls. Cover with a towel and allow to rest for 30 minutes. While the dough rests heat your oven to 500 F and place a pizza stone, or cast iron skillet, on the bottom rack of the oven. 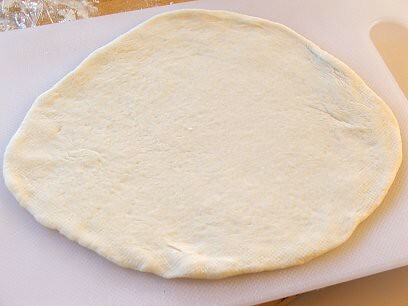 Once fully rested roll out the dough until it is about 6″ to 7″ wide. It should be fairly thin. 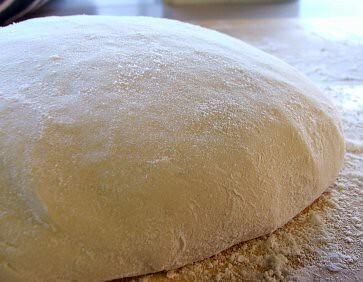 Moisten your hands with water, gently pass the dough between your hands to moisten gently, then lay on the hot pizza stone. Close the oven and bake for 2 1/2 to 3 minutes, or until puffed and beginning to get brown spots. Remove from the oven, brush lightly with ghee (or melted butter) and cover with a cloth. You may need to press the naan to release the air inside.